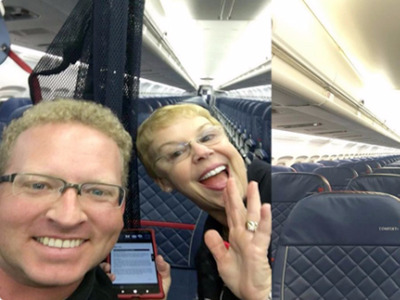 Twitter/WSB-TVSteven Schneider was the lone traveller on Delta flight 2426. An Atlanta man just lived every air traveller’s ultimate dream: He was the only passenger on board. Steven Schneider had a ticket for Delta Airlines flight 2426 from from New Orleans to Atlanta, but found the gate deserted when he arrived, WSB-TV reports. But it turned out that, due to delays, all of the other passengers had switched to different flights. Delta tried to contact Schneider to see if he was interested in switching, but they had the wrong number. That’s how Schneider got the entire 160-seat aeroplane to himself. No snoring, no crying, no crawling over the guy in the aisle seat to get to the bathroom.